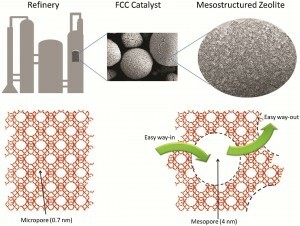 The Y zeolite is used as a catalyst for fluid catalytic cracking. It has a high surface area and large pores and is thermally and hydrothermally stable. But scientists are working on improving the catalyst for a better performance. One reason is that the 7.4Å micropores are limited in terms of size of hydrocarbon that they can take in. The process involves diffusion of large hydrocarbon molecules into the crystals and diffusion of the desired intermediate cracking products (diesel or light oil, gasoline and liquefied petroleum gases) out. Introducing wider pores allows large hydrocarbon molecules to go through the process. Scientists from Spain had recently carried out a templating process (using a surfactant) to introduce highly controlled mesoporosity into zeolites. This led to improved catalytic selectivity, in which more gasoline, light oil and liquefied petroleum gas were obtained. The team have now scaled up the catalyst and tested its hydrothermal stability and catalytic cracking performance in a refinery. The catalyst showed much better product selectivity compared to the current catalyst, says the team.